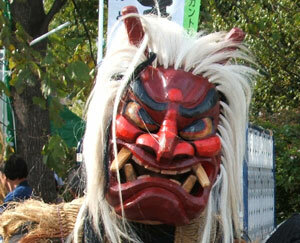 Here is a list of some of the best festivals / holidays in the Tokyo area. There are too many festivals all over Japan to write each one (there are even too many just within the Tokyo area). But here are some of the ones that I recommend. I’ll add any that I may have forgotten as I remember them. 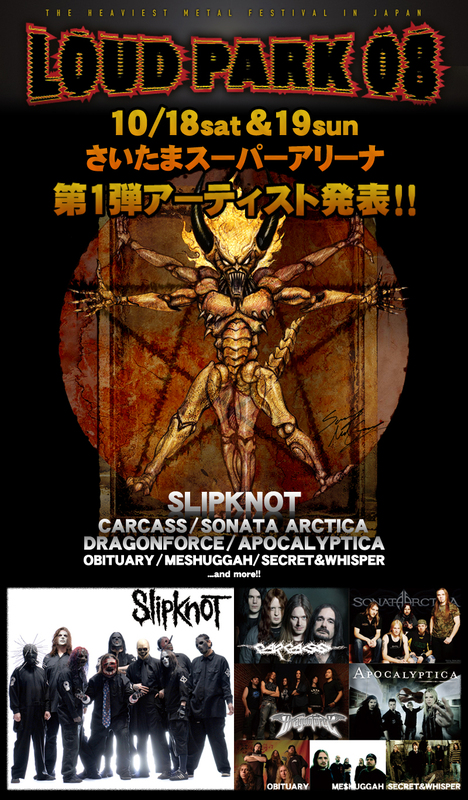 If the festival’s name is written below in red, that means it’s in the Tokyo area. Ones written in green are outside Tokyo, but recommended. If you have any questions about any Japanese festivals / holidays (how to get there, more information about the festival, etc), please click here to contact me. New Years is the biggest holiday in Japan. Besides having a traditional dinner with all the relatives, many people go to local temples for the events there.This is one of the two times a year that the royal family greet the public at the Emperor’s Palace.If you visit Tokyo Disneyland, you might see Mickey and Minnie Mouse wearing 着物 (Japanese kimono).Also, many stores sell 福袋 (“Lucky Bag” or “Happy Bag”) which are bags full of items from the store sold at a special price. You can’t look inside the bag until after you pay for it…which many people consider part of the fun. In the famous 歌舞伎座 (Kabuki Theater) in 銀座 (Ginza, Tokyo). At the 国技館 (Sumo Arena) in 両国 (Ryogoku, Tokyo). An elaborate demonstration by Tokyo’s firefighters using ladders, firehoses, and firetrucks. This is a holiday to celebrate young people entering adulthood. People who just turned 20 years old (or will become 20 this year) wear a 着物 (kimono) or suit and attend a ceremony. 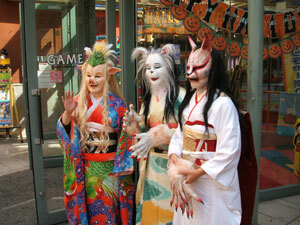 Afterwards, many young people in kimono can be seen going to an amusement park or somewhere to celebrate together. In 横浜中華街 (Yokohama Chinatown), 中国の新年 (Chinese New Year) is celebrated with an elaborate festival including the famous Chinese dragon dance. Chinese New Year falls on a different date each year. But it’s always somewhere from about Jan 21 – Feb 21. The internationally famous snow festival on Japan’s northern island with huge ice sculptures. Many temples in Japan have sumo wrestlers or other celebrities throwing soybeans at the crowd. Sometimes still referred to as Girls Day because this is a festival / holiday for daughters. Homes set up elaborate doll sets. (See my FAQ entry about it here). 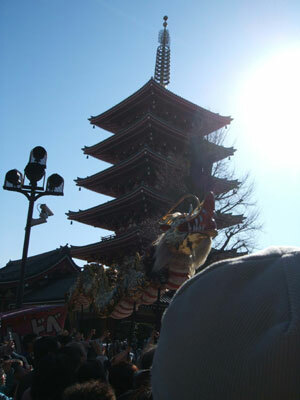 A long, golden dragon is paraded elaborately through the temple grounds at 浅草寺 (Sensou-ji Temple) in 浅草 (Asakusa). Sakura (Cherry Blossoms) are very important to the Japanese. Cherry Blossom Viewing involves setting up a picnic under the trees and enjoying the view. In Tokyo, 花見 (Cherry Blossom Viewing) is in early – mid April. (I wrote three posts about our Cherry Blossom Viewing in April 2008: here and here and here). This actually takes place a few times a year and in a few different locations around Tokyo…including Kamakura, Meiji Jingu, Takadanobaba, and Nikko. In April, it can be seen at Sumida-gawa. This event involves archers on horseback running full gallop down a course and shooting arrows at three targets along the course! (My post about it is here). 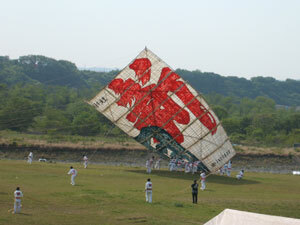 Teams fly giant 900kg kites. One of the biggest festivals in Tokyo. (I wrote a post about it…here). Another one of the biggest festivals in Tokyo. A festival to mark the opening of Yokohama Port. A festival with a 神輿 (portable shrines) parade. One of the biggest festivals in Tokyo. Only occurs on even-numbered years (such as 2008, 2010, etc). 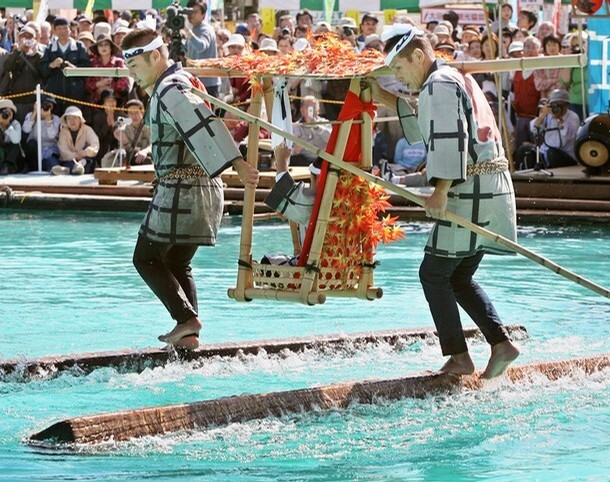 An elaborate boat race in Japan’s southern island. In 神奈川県 (Kanagawa Prefecture), this is one of Japan’s largest Tanabata festivals. This is Kyoto’s biggest festival. It lasts all July…but the highlight is mid-July, when there’s a parade of 32 traditional floats called Yamahoko. A similiar festival to the one in Kyoto. This one’s in Narita, Chiba (90 min north of Tokyo). A big festival at 靖国神社 (Yasukuni Shrine) to remember the deceased. See my post about it here. At the Imperial Palace (and other places around the country), illuminated paper lanterns are set afloat to guide the deceased back for the Obon holidays. In 埼玉県 (Saitama Prefecture), a festival with a parade of floats and paper fans. One of Japan’s three biggest festivals. At Osaka’s 天満宮 (Tenmanguu Grand Shrine) with 神輿 (Mikoshi portable shrines) and fireworks. A popular music festival in 新潟 (Niigata). A popular music festival in both 東京 (Tokyo) and 大阪 (Osaka). A regular Japanese summer festival with 金魚すくい (scooping for goldfish), Japanese food booths, etc…but also has ice sculptures. 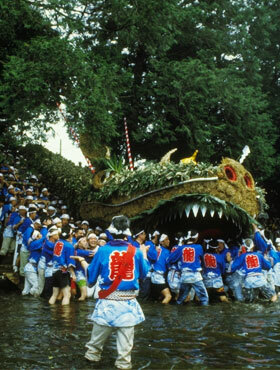 In 埼玉県鶴ヶ島市 (Tsurugashima city, Saitama Prefecture), a giant dragon float is carried by 300 men through the town and into a pond. This is a centuries old local custom for this small town to bring rain for the local farmers. At the Peace Memorial in 広島 (Hiroshima), this ceremony is to mark the anniversary of the atomic bombing of the city. Thousands of paper cranes are set afloat into the river as a symbol of peace. A lively festival in 青森県 (Aomori Prefecture) that has a unique dance and illuminated floats of famous Japanese folklore. One of the three biggest festivals in Tokyo. Includes a crowd throwing water on the people carrying the 神輿 (portable shrines). This festival occurs every year, but every three years is the big full version (2008, 2011 2012 (2011’s festival was postponed to 2012 due to the March 11 earthquake), 2014 2018, etc). A very popular (ie: crowded) Japanese summer festival with traditional Japanese food booths and 盆踊り (Bon dancing). (A short walk away is Roppongi Hills 盆踊り (Bon dancing) festival, usually held on the same days). A festival of Brazil’s Samba dancers in the old, traditional town of Asakusa, Tokyo. Traditional dancing and 神輿 (portable shrines). 流鏑馬 (Horseback archery) show in 神奈川県鎌倉市 (Kamakura in Kanagawa Prefecture). A festival to promote tourism to Japan in 池袋 (Ikebukuro, Tokyo). Includes portable shrines, Taiko drumming, and a Karate demonstration. In 横浜中華街 (Yokohama Chinatown), a festival with a Lion Dance and firecrackers to celebrate China’s founding. Includes a parade of giant figures from Japan’s history. Lumberjacks in the town of 木場 (Kiba, Tokyo) put on a log-rolling show. 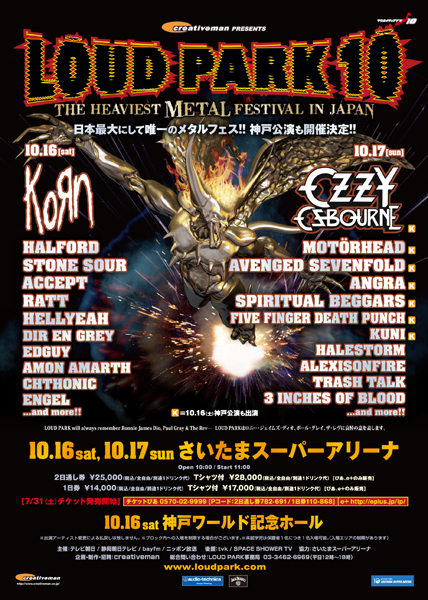 A two-day music festival featuring some of the biggest names in heavy metal, such as Megadeth, Dio, Slayer, Motley Crue, Slipknot, etc. 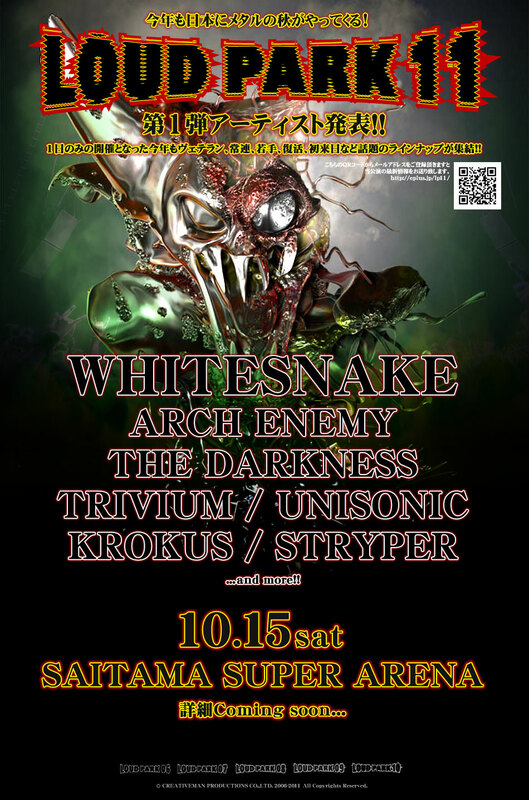 Click here for the “Loudpark ’09” website (in Japanese). Huge floats are paraded through this very traditional area just north of Tokyo. In the evening, the floats “battle” to pass when they meet each other. Click here to see my post about this festival (with photos). This event has a Halloween costume parade (not free), a costume contest, and children can “Trick ‘R Treat” at participating stores to get candy. A holiday for girls aged three and seven and boys aged five years old. Children of these ages are taken to shrines to be blessed for a long, healthy life by their parents and grandparents. The girls wear a fancy 着物 (kimono) and the boys wear either a 着物 (kimono) or a suit. They are given special candy and usually taken to a photo studio afterwards to have their portraits taken. In 秋田県 (Akita Prefecture), villagers dressed as boogeymen visit homes that have children and ask if there are any misbehaving children in the home, and they warn the children not to be bad. Almost always results in the children crying, until their parents assure the boogeyman that the children don’t misbehave. At midnight on New Years Eve, many Japanese go to a temple for the ceremony in which the temple priest rings the temple bell 108 times to signify the 108 sins of man in Buddhist teachings. Also, on New Years Day, the first meal that Japanese people eat is supposed to be noodles. And then many Japanese visit a temple or shrine within the first week of the New Year for the numerous New Years traditions that Japanese have. How long have you been living in Guam? Which part of Japan were you born in? Yes. Many great festivals / events all year round!